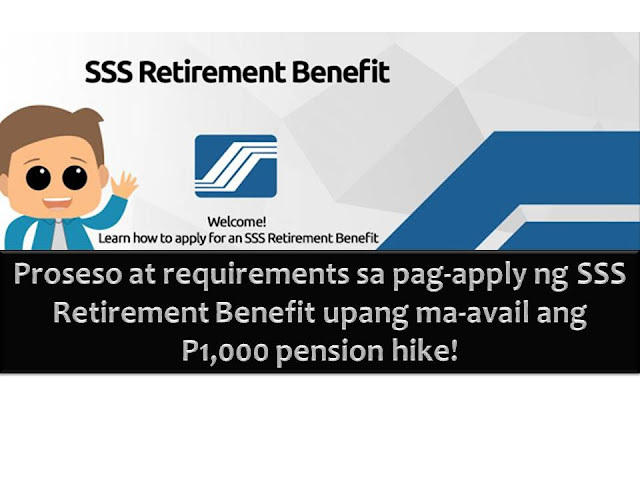 THOUGHTSKOTO Thoughtskoto : How to apply for an SSS Retirement Benefit and to avail additional P1,000 in monthly pension? How to apply for an SSS Retirement Benefit and to avail additional P1,000 in monthly pension? President Rodrigo Duterte's promise to SSS retirees has been fulfilled after Malacanang Palace approved the release of additional P1,000 in SSS pensions. This is indeed a good news for those who are already receiving their pension from SSS and for those who are planning to retire and enjoy their SSS retirement benefit. SSS president and chief executive officer Emmanuel Dooc said pensioners would receive the P1,000 benefit increase starting on March 3. Pensioners will get the additional P1,000 pension increase for January, February and March on March 3, 10 and 17, respectively. And starting on April 2017, the benefit increase will be incorporated in the regular pension. SSS retirement benefit is a cash benefit, paid out either in monthly pension or as a lump sum to a member who can no longer work due to old age. Monthly Pension - a lifetime cash benefit paid to a retiree who has paid at least 120 monthly contributions to the SSS prior to the semester of retirement. The monthly pension is paid for not less than 60 months. A retiree has the option to receive the first 18 months pension in lump sum, discounted at a preferential rate of interest to be determined by the SSS. This option can be exercised only upon filing of the first retirement claim, and only advance payments shall be discounted on the date of payment. The Dependent’s Pension and 13th Month Pension are excluded from the advanced 18 months pension. The retiree will receive the regular monthly pension on the 19th month and every month thereafter. How monthly pension is paid? A member must open a single savings account and submit to the SSS his savings account number and a photocopy of his passbook upon the filing of his application, or he may accomplish the Visa Cash Card Enrollment Form. The original copy of the passbook must be presented for authentication purposes. For ATM accounts, the name of the member must be embossed and the savings account number must be indicated in the ATM card; otherwise, a copy of the deposit slip must be submitted. Lump sum amount - granted to a retiree who has not paid the required 120 monthly contributions. It is equal to the total contributions paid by the member and by the employer including interest. To qualify for a lump sum retirement benefit, a member is at least 60 years old (or 55 years old, if an underground mineworker) for optional retirement, or 65 years old (or 60 years old, if an underground mineworker) for technical retirement, and has paid less than 120 monthly contributions. How lump sum pension is paid? Payment of Lump sum Benefit Effective May 2016, the member may opt to receive the lump sum benefits for SS and EC Disability, SS Death and Retirement directly through his/her bank account, instead of receiving the check through the mail. The Payment thru-the-Bank Program shall become mandatory upon implementation of the Benefits Workflow System. Visa Cash Card Enrollment Form. The original passbook/ATM card must be presented for authentication purposes. For members without an existing single savings account, the SSS shall issue a Letter of Introduction (LOI) form to be presented to his/her chosen SSSaccredited bank for the purpose of opening a single savings account. Do you want to know how much SSS pension you will receive base on your contribution? Click the link below. HOW MUCH WILL YOUR SSS PENSION BASE ON YOUR CONTRIBUTIONS? Has reached the age of 65 even if still employed/self-employed. Has reached the age of 60 years even if still employed/self-employed. A member can file for Retirement Benefit personally or through a representative. Duly accomplished Retirement Claim Application (RCA) Form; or Application for DDR Benefit under the Portability Law, if applicable. Present SS card or two (2) valid IDs both with signature and at least one (1) with a photo for authentication purposes. Original of any one (1) of the Member’s primary ID cards/documents or two (2) secondary ID cards/documents, both with signature and at least one (1) with a photo. To file for Technical Retirement, members should meet the following conditions. Retirement claims submitted through the SSS website shall be processed using the DDR Workflow System following the usual procedures on the Processing of Retirement Claim Application. Applications for retirement benefit are filed at any SSS branch or representative office. Be sure to bring with you the abovementioned requirements.